• Tennessee: A black bear killed a man in the Great Smoky Mountains National Park. Some confusion ensues. Park officials have shot and killed the bear associated with the investigation into a man's death. Spokeswoman Julena Campbell said it happened around 9:45 Sunday morning [Sept. 9]. A news release Wednesday said the National Park Service had euthanized a male bear after finding it near a man's body in Great Smoky Mountains National Park. On Friday, the park said rangers actually had not yet found and killed the bear. • Wyoming: A bowhunter and his guide were attacked by grizzly bears in the Teton Wilderness; the guide was killed. As initially reported, a grizzly bear attack on an elk hunter and his guide wounded the client hunter Corey Chubon, from Florida, and left the guide, Mark Uptain, dead. His body was recovered yesterday from the scene in Turpin Meadows at approximately 1:15pm. UPDATE: More information on the incident. Apparently bear spray was used. • Oregon: A woman hiking was killed by a mountain lion in the Mount Hood area. The body of Diana Bober, 55, was found Monday [Sept. 10] at the bottom of a 200-foot embankment on the famous Oregon mountain's Hunchback Trail, the Clackamas County Sheriff’s Office said Tuesday. We'll Build a Sheriff's Office, and We'll Get Texans to Pay for It. A friend was driving into the county a couple of months ago on a certain road, and I warned him to s-l-o-w d-o-w-n about about mile marker 55, because that road is the sheriff's favorite speed trap. The sheriff actually said in a recent meeting that traffics fines pay for one deputy's salary, not that he has a lot of deputies. And Texans hurrying up from the south to get to the ski areas pay a good share of that. Trophy Club? To get there, do you go through Trophy House and Trophy Wife? Of course, our little county is nothing compared to the effort that Wyoming law enforcement makes during the annual Border War. I heard that even Sheriff Longmire was down there writing tickets. After reading a lot of mystery novels by Peter Bowen and Keith McCafferty (Montana) plus Craig Johnson and C. J. Box (Wyoming), I have assembled enough ideas for a decent undergradate paper with a simple compare-and-contrast methology. Although her novels are set in Wyoming, Margaret Coel lives in Colorado. Still, much of what I will say applies to her works too. 1. The Protagonist. The idea of the "wounded detective" is common. Fictional dectectives are often divorced, widowed, deeply depressed (especially in Scandanavia), using or recovering from too much booze & drugs, or fired from a job in law-enforcement, among other possibilities. Coel's Catholic mission priest, John O'Malley, a recovering alcoholic, is isolated by both his clerical vocation and his location on the Wind River Reservation. Often they are marginalized in some respect. Bowen's Metis brand inspector-deputy sheriff, Gabriel Du Pré, is Métis, descended from the French/indigenous mixed-blood ethnic group who originated around the Great Lakes, but some of whom moved to eastern Montana in the 1860s–70s, before and after the Red River Rebellion. Father O'Malley is a white priest on the reservation, while Box's Joe Pickett is frequently in conflict with his superiors in the Wyoming Game & Fish Department. 2. The Milieu. A low population is essential. Gabriel Du Pré operates in a fictional locale somewhere north of Miles City. Johnson's Sheriff Longmire patrols the thinly populated fictional Absaroka County, somewhere in northern Wyoming, not far from the district where Box's game warden protagonist, Joe Pickett, enforced wildlife laws. The Wind River Reservation's population exceeds 40,000, thinly spread, but you do not feel their presence in the novels. Sean Shanahan, McCafferty's artist-fishing guide amateur detective, pops into Ennis, West Yellowstone, and other towns, but spends more time on the rivers. All seem allergic to cities. Gabriel Du Pré hates going to Bozeman, while Joe Pickett regards Cheyenne as just slightly better than Mordor. 3. The "Animal Helper." Although several protagonists often have a dog riding with them, what I mean here is the old folkloric theme of the animal who establishes a special relationship with the hero — for example, the hero is a hunter pursuing a fox, but he spares the fox who then protects him or helps him to secure wealth. Joe Pickett's feral helper is the falconer Nate Romanowski, a mysterious ex-special operations soldier who lives in isolated places and has no visible means of support, but who pops up in the nick of time of save Joe, dropping bad guys at 800 yards offhand with a .454 Casull revolver or something similar. For a time Romanowski lives with an Arapaho woman until she is murdered. Father O'Malley has Vicky Holden, the Arapaho lawyer who connects him with the reservation and its people. Sheriff Walt Longmire's closest friend is Henry Standing Bear, a Cheyenne. Although Lou Diamond Phillips ably portrays Standing Bear in the TV series, in the books Standing Bear is more like Beneetse — in touch with ghosts and ancestors and also seemingly able to materialize, like Nate Romanowski, when Longmire is in desperate straits. McCafferty's detective, Sean Stranahan, has no Indian helper, but possibly the fishing outfitter Rainbow Sam, Sean's sometime employer, could fit the bill, for by comparison to the past-haunted hero, Sam is hard-drinking, pleasure-seeking, and present-oriented. 4. The Plots. Many of these are recognizable from the last thirty years' news. At least two of these authors have used each one of these. The Cult. Clearly inspired by the Church Universal and Triumphant's operation north of Yellowstone Park in the 1980s, this plot has some mysterious but well-financed group building a headquarters in an isolated area. Murder usually ensues. See also "The Anti-Government Group." C. J. Box in particular shows some degree of sympathy with small-L libertarian types, however, which leads to some plot twists. The Evil Energy Company. Enough said. See also "Evil Rich People." The Scheming Archaeologist. No, Tony Hillerman did not own this one. Suppose that an archaeologist had a major, career-capping find that somehow places him in conflict with the Native American Graves and Repatriation Act. . .
Ecoterrorists and Animal Rights Extremists. They mean well, but people get hurt and they are trying to shut down the struggling local ranchers. The Dinosaur. Inspired by the story of the T-Rex skeleton called Black Hills Sue, this one involves a spectacular fossil find with disputed ownership — various people want to profit from it. It puts the "skull" in skullduggery. The Outsiders. All these people want to ruin Wyoming or Montana, and the hero fights a rear-guard action. Peter Bowen is the strongest here, sending a message to his readers that might as well read, "You readers are a bunch of Subaru-driving, Patagonia-wearing recreationists who just ought to keep the hell out of eastern Montana. Don't come here. Don't look for a real Gabriel Du Pré. Just stay on Interstate 90 and keep going to Bozeman. Oh yeah, buy my books." Well, there you have it. Just add more examples and analysis. A guaranteed A-. From northwestern Wyoming, Cat Urbigkit posts a brief video of her family's sheep coming down from summer range. The dogs, of course, are at the end. This video demonstrates transhumance — the season movement of livestock and people, something that occurs throughout the American West. Most range flocks include about 1,000 ewes, accompanied by their lambs. This Wyoming flock is owned by a family ranch, one of 600 range outfits in the West. Last week was the 50th anniversary of the Wilderness Act, and this was my family's way of celebrating what wilderness means to us — cheers to man and beast! All the dogs with black coloration are herding dogs (5 or 6 with this herd). There were 7-9 livestock guardian dogs with this bunch as well - both white and some red-coloration (representing Akbash and Central Asian Ovcharka lineages). Archaeologists find a series of Archaic mountain villages in Wyoming, and the dates lead them to wonder if Numic-speaking people (ancestors of the Comanche, Ute, Shoshone and Northern Paiute) migrated from the Rockies to California, instead of the other way around, as had been assumed. It reminded me of a trip that I made to the Windy Gap site in Colorado's Middle Park back in my newspaper-reporter days. It dated back at least 5,000 years, and the unusual feature was that it showed evidence of a hut with wattle-and-daub walls. The elevation, as I recall, is at least 9,000 feet. Wattle-and-daub construction has been found around the world, but its presence suggests at least semi-permanent seasonal occupation, as opposed to building a quickie shelter or small tipi for a hunting camp. High altitude living probably was not a winter proposition — Fraser, Colo., near Windy Gap, used to claim it was the "Icebox of the Nation." (So have some other towns elsewhere.) The Wyoming sites were probably too chilly too, if one had the option of going lower down. Hydrologists measure "water years" from October through August, so this diagram shows the year that just ended. ¶ An article on the possibly oldest petroglyphs in North America associates them chronologically with a set of human remains known as Spirit Cave Man. The interesting thing is that Spirit Cave Man (like Kennewick Man) does not appear to be an American Indian but looked more Caucasoid, perhaps like the Ainu of Japan and Far Eastern Russia. 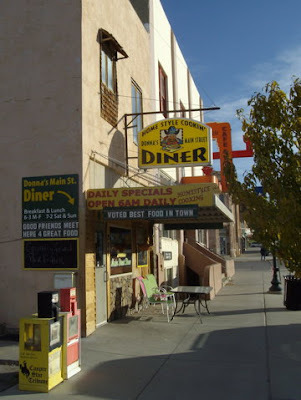 ¶ An update on the "North(ern) Colorado" secession movement. It's going to the voters in some counties. ¶ A recent spate of bear attacks. 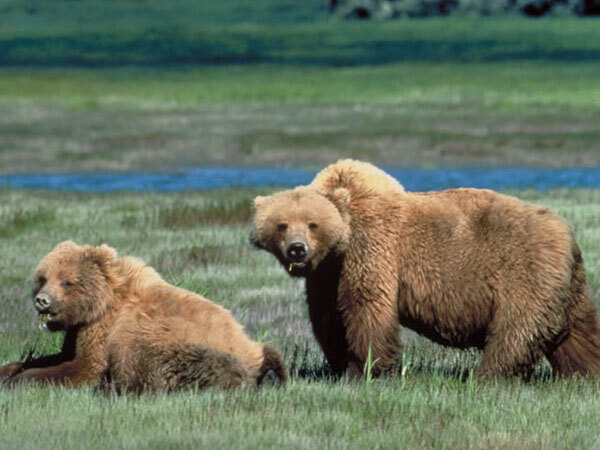 Bear spray was used in Yellowstone, but maybe not quickly enough? ¶ Couple in Divide successfully start a goat cheese business. The site is the former Alpine Lakes Resort north of town. "We did not intend to make it on this level," Bob McMillan said. "It started as a harmless retirement thing that got out of control." Donna's Main Street Diner — the classic knotty pine-and-deer heads Western cafe. What did I eat? Some kind of scrambled up eggs-potatoes-meat combination. Coal trains rumbled past the motel all night, but whereas highway traffic bothers me, trains do not so much. When I was a college student, a friend and I rented a house in Portland, Oregon, of which we said, "The Southern Pacific runs through the kitchen." The trains kept me awake for one night, but never again thereafter. Nourished at Donna's, I set out for a day poking around in the Black Hills. A federal appellate court has upheld the 2001 Roadless Rule on national forests in a case brought by the state of Wyoming. The state tried to argue that by protecting roadless areas — which is a Good Thing for animals like elk — the Forest Service was creating "wilderness." And "wilderness," in the legal sense, must be created by Congress, not the executive branch. In a 120-page decision, the court said that full wilderness protection was far deeper than the mere banning of roads in certain places and that the Forest Service had broad jurisdiction in setting the balance of uses on the lands that it manages. “The Forest Service did not usurp Congressional authority because the roadless rule did not establish de facto wilderness,” the court said in a decision written by Judge Jerome A. Holmes, who was nominated to the court by President George W. Bush. This was the Tenth Circuit Court in Denver—the Ninth Circuit had reached a similar conclusion two years ago. I am no legal scholar, but I think that as long as the different federal appellate courts agree, the Supreme Court is less likely to be interested in such a case. Qualified legal experts are welcome to enlighten me. But Wyoming could always try another appeal. OK, you have been camping for a few nights. Maybe someone wants to wash her hair. But most of the campgrounds do not have showers. And the rivers (except the Firehole) are pretty cold. Go to the Old Faithful Inn. 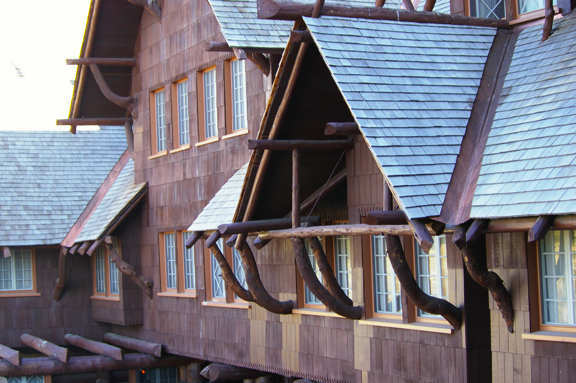 You could go to the hotel in Mammoth too, but let's face it, the Old Faithful Inn is the most tradition-soaked, parkitecture-perfect building in Yellowstone. Bring a bag with a towel, soap, shampoo, etc., unless you want to pay extra. Walk up to the registration desk and tell the clerk that you wish to take a shower. The clerk will collect $3.45 and direct you up the creaking stairs to a restroom with shower stalls in the back. The stalls are clean, tiled, and have windows that open to views like the one above. The shower is an old-style pierced disk high overhead. It feels wonderful. Once clean and dry, stop at the Mezzanine Bar for a Snake River Lager, then carry it outside to one of the benches facing the Old Faithful Geyser and watch for it to erupt. At Yellowstone: Why Close So Many Campgrounds in Early September? On Friday we arrived at the big Madison Campground at Yellowstone. Like all park lodging and most of the bigger campgrounds, it is operated by a concessionaire, Xanterra Parks & Resorts. At this time of year, campgrounds are closing—too fast, I think. Madison (85 sites) was full every night of the four that we stayed there. Norris Campground (100 sites) was full too. My old favorite, Slough Creek, has become impossible since the advent of the wolf cult. Canyon CG was already closed, although the weather was warm, and the Canyon lodge-restaurant-visitor center area was swarming with people. It seems to me like they could make money keeping it open—I would have preferred to stay on the east side of the park. One thing M. and I had anticipated was being spared all the news media navel-gazing over the tenth anniversary of the September 11, 2001 terrorist attacks. 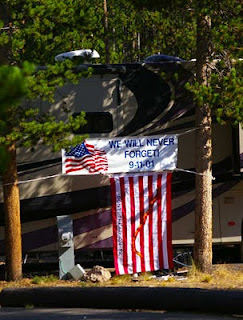 But right across from our campsite someone had draped their motorhome with the banners pictured. Like we needed their help to "never forget." Sheesh. On Thursday, Sept. 8, after breakfast and a little exploration of one corner of Colorado State Forest State Park, we continued north into Wyoming: Saratoga to Walcott to Rawlins to Rock Springs to Pinedale (burger stop at the Wind River Brewing Co.) to Jackson to Grand Teton National Park. We passed our usual North Park campsite: Cowdrey Lake State Wildlife Area north of Walden, Colo. If you want the basics—a flat place to park, an outhouse, and a small lake in which to fish—it meets the bill. North of Cowdrey, some volunteer firefighters and the Jackson County sheriff's office were dealing with a fresh one-minivan rollover wreck. M. is still talking about the luxuriant black handlebar mustache worn by one of the deputies. Very 1890s. Once through Jackson, we took the road that leads to Kelly, Wyo., the hamlet closely described in Ted Kerasote's Merle's Door: Lessons from a Freethinking Dog. Before Kelly, you pass by the Gros Ventre Campground, which the park's website describes as rarely filling—a good thing, since you cannot make a reservation. Its 350 sites extend through a big grove of narrowleaf cottonwoods. A river runs through it. The only downside we could see is that the campground is somewhat in the approach/departure corridor for aircraft using Jackson Hole Airport, the only commercial airport located in a national park. As the sun peeked over the mountains, I got up to use the restroom and encountered moose—two young bulls alternately feeding and play-sparring. Moose stalkers and bear-proof (or bear-resistant) dumpster. As the two moose moved through the campground, they were stalked by early-rising photographers—from a safe distance. On Friday morning, we ate breakfast, took a stroll through the campground, then packed up our pop-up camping trailer and continued north into the weird and the wonderful that is Yellowstone National Park. We are lucky to have a world-class fishery in our own extended backyard, on the Green River below Flaming Gorge Reservoir​. Unfortunately, this great run of river is now threatened by a monumental boondoggle that could destroy one of the finest fishing destinations on the planet. Aaron Million's proposed water pipeline would stretch from Flaming Gorge Reservoir in Wyoming and Utah, some 560 miles to the massive population centers of Colorado's Front Range​. 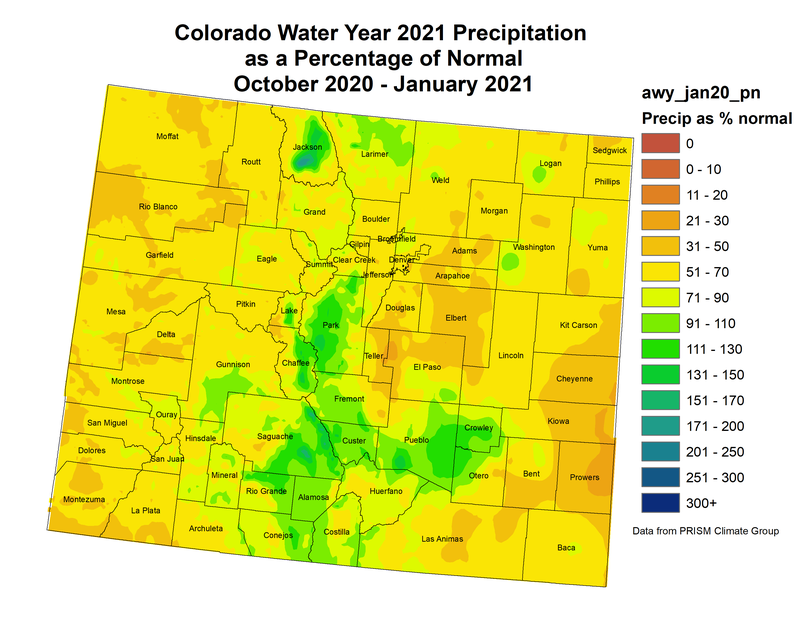 After all, why should we worry about preserving what little is left in America of wild nature when water board members believe the river's flows would be better used to maintain wasteful blue-grass lawns, golf courses, swimming pools and car washes around the Denver area? In addition to the obvious self-centeredness and amorality of Million's outrageous proposal, consider the construction cost, currently estimated by state agencies to run as high as $9 billion, with another $123 million per year, in perpetuity, required to operate and maintain the pipeline. Just what we need in a strapped economy! Nor would it be a bargain for Front Range residents, requiring farmers and homeowners to pay the highest fees ever for water. If such a thing [as "Footnote of the Year"] existed, it should surely go to this, from Catriona Mortimer-Sandilands and Bruce Erickson's introduction to Queer Ecologies: discussing Brokeback Mountain as gay pastoral, they comment: "Although there are clear differences between Wyoming and Arcadia, both physically and economically."